1st. That those who invoke the virgin mother by her sorrows, before death will merit to obtain true repentance of all their sins. 2nd. That he will protect such in their tribulations, especially at the hour of death. 3rd. That he will impress upon them the memory of his passion, and that they shall have their reward for it in heaven. 4th. That he will commit such devout servants to the hands of Mary, that she may dispose of them according to her pleasure, and obtain for them all the graces she desires. Click here, to visit the section on this website, dedicated to the Virgin Most Sorrowful. September 1: FIRST FRIDAY/Commemoration of St. Giles Abbot; Commemoration of the Holy Twelve Brothers Martyrs. September 2: FIRST SATURDAY/St. Stephen, King of Hungary, Confessor, Simple. September 3: XIII Sunday after Pentecost, Double; Commemoration of St. Pius X Pope and Confessor. September 5: St. Laurence Justinian Bishop and Confessor, Simple. September 8: Nativity of the Blessed Virgin Mary, Double of the II Class; Commemoration of St. Adrian Martyr. September 9: Commemoration of St. Gorgonius Martyr. September 10: XIV Sunday after Pentecost, Double; Commemoration of St. Nicholas of Tolentino, Confessor. September 11: Commemoration of Ss. Protus and Hyacinth Martyrs. September 12: The Most Holy Name of Mary, Greater Double. September 13: Feria/Centenary of the 5th Apparition at Fatima. September 14: Exaltation of the Holy Cross, Greater Double. 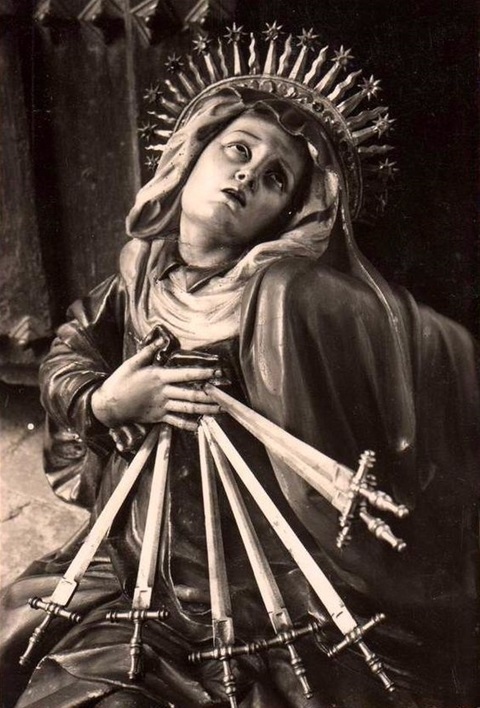 September 15: Seven Sorrows of the Blessed Virgin Mary, Double of the II Class; Commemoration of St. Nicomedes Martyr. September 16: St. Cornelius Pope and St. Cyprian Bishop, Martyrs, Simple; Commemoration of Ss. Euphemia Virgin, Lucy and Geminian Martyrs. September 17: XV Sunday after Pentecost, Double; Commemoration of Impression of the sacred Stigmata of St. Francis, Confessor. September 18: St. Joseph of Cupertino Confessor, Double. September 19: St. Januarius Bishop and Companions Martyrs, Double/171th Anniversary of the Apparition of Our Lady at La Salette, France. September 20: EMBER WEDNESDAY/St. Eustace and Companions Martyrs, Double. September 21: St. Matthew Apostle and Evangelist, Double of the II Class. September 22: EMBER FRIDAY/St. Thomas of Villanova Bishop and Confessor, Double; Commemoration of Ss. Maurice and Companions Martyrs. September 23: EMBER SATURDAY/Commemoration of St. Linus Pope and Martyr; Commemoration of St. Thecla Virgin and Martyr. September 24: XVI Sunday after Pentecost, Double; Commemoration of Our Lady of Ransom. September 26: Commemoration of Ss. Cyprian and Justina Virgin, Martyrs. September 27: Ss. Cosmas and Damian Martyrs, Simple. September 28: St. Wenceslaus Duke, Martyr, Simple. September 29: Dedication of St. Michael Archangel, Double of the I Class. September 30: St. Jerome Priest, Confessor, and Doctor of the Church, Double.